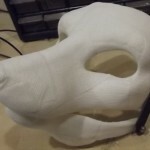 That particular mask was made using the Kobra cast and i basically cut up small 2×3″ pieces from the roll to start. 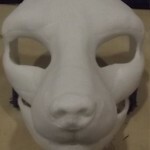 I already had a silicone/plaster mold made of the fox mask and usually use it for plastic rotocasting. 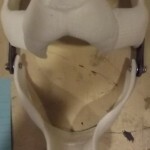 I held onto each piece and used my heat gun to soften up the plastic and place them into the mold. once placed i again use the heat gun in the mold and wet my fingers to press it into all the details. This was done in 3 layers. I tried using the boiling water method but it would end up too hot to handle or would cool down too fast to use. heat gun worked great and you could easily adjust how floppy you wanted the stripe. You do need to be careful as you can overheat the plastic and cause it to brown and burn. I find the strips get a slight gloss to them when melted to the right temperature and ready to use. I do like that this material is very study and has a lot of flexibility without the worry or cracking or breaking like normal rotocast resins. This is great to use as a base for masks, armor, props but you will need to cover with some other material as it will still look lumpy and patchy.